The Calvert women are often overshadowed by their sons or husbands, but a couple of individuals played important supporting roles in the formation and development of Maryland. Anne Arundell was born in 1615 into an elite English family of noble lineage. Anne's father, Sir Thomas Arundell of Wardour Castle in Wiltshire, England had served under King James I and her great-grandmother had been related by marriage to King Henry VIII. Anne was reputed to be very beautiful, with many potential husbands. 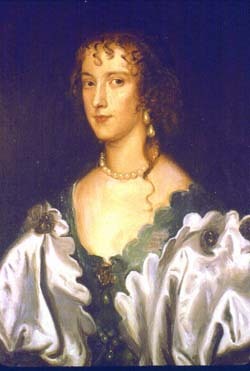 But in 1628 when she was only 13, she married Cecil Calvert, the second Lord Baltimore and a close friend of the family. Like the Calverts, Anne's family was Catholic, and her father was arrested a number of times because he refused to give up his religion. 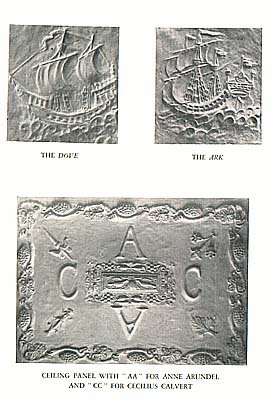 Cecil's marriage to Anne was fortunate for the creation of Maryland. Anne inherited lands and money from her father which she and Cecil used to fund the new colony. But there was more to Anne than just her money. 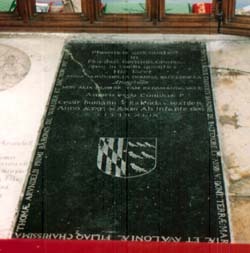 She played an important role in raising her son Charles, the future Lord Baltimore, as well as Cecil's younger half-brother Philip, who served as Governer and Chancellor of Maryland. During her 20-year marriage to Cecil, Anne bore nine children, but only three lived to become adults. She was very well-loved and upon her death at age 34, her husband Cecil composed a memorial verse for her tomb in England in which he described her as "the most beautiful and best wife." The memorial continued, "Here lieth Anne Arundell, Lady Baltimore. Farewell to you most lovely of earthly beauties." Although neither she nor her husband ever visited the colony that they helped found, Anne was very interested in Maryland. 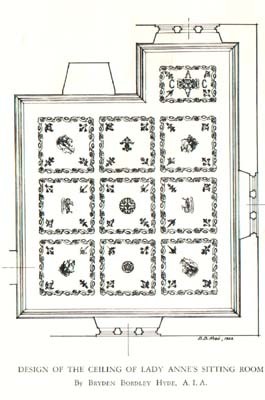 She decorated the ceiling of their home in England with plaster reliefs of the Ark and the Dove, the ships that brought the first colonists to Maryland. Indirectly, Anne played an important role in the early years of Maryland, and she seems to have been well-loved and respected. In 1649, the Maryland Assembly chose to honor Anne after her death by naming Anne Arundel County after her. Portrait of Anne Arundell, Lady Baltimore, attributed to Van Dyk, (privately owned, courtesy of Dr. Edward C. Papenfuse). 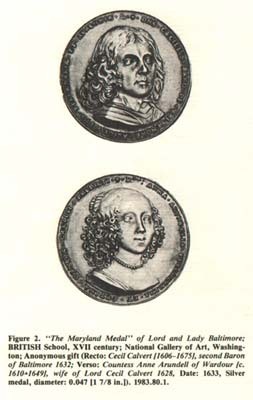 "The Maryland Medal" of Lord and Lady Baltimore; British School, XVII century; National Gallery of Art, Washington; Anonymous gift (Recto: Cecil Calvert [1606-1675], second Baron of Baltimore 1632; Verso: Countess Anne Arundell of Wardour [c. 1610-1649], wife of Lord Cecil Calvert 1628, Date: 1633, Silver medal, diameter: 0.047 [1 7/8 in.]). 1983.80.1. Scanned from The Maryland State Archives 350th Anniversary Document Series: "A Relation of The Successefull beginnings of the Lord Baltemore's Plantation in Mary-land," Maryland State Archives, 1990. Papenfuse, Edward C. "The Forgotten Mothers of Maryland." Speech to the Society of the Ark and Dove, November 19, 1995. Topic File: MSA SC 1456-1170.